The Two American Lottos Compared! US Powerball vs. MegaMillions: Which Is the Best American Lotto Anyways? Now that Australians can finally target the world’s biggest jackpots by betting on US Powerball and MegaMillions with Lottoland, it’s time to get to know these two giants a little better. For example, did you know both of them guarantees a minimum jackpot of $40 million USD (approx. $54 million*)? Or which of them gives the best chances of having a return of investment? Just check out this guide we prepared comparing the US Powerball and MegaMillions! Which of these two billionaire-makers is the best American lotto anyways? And let the duel begin! In January 2016, the whole world watched with astonished eyes as three lucky people shared an over $2.2 billion* lottery jackpot. The US lottery Powerball was making history as the first ever lottery to draw a billion-dollar jackpot. Only to break the previous record, held by its big competitor MegaMillions: $860 million* jackpot, also hit by three lucky winners, in March 2012. In fact, on the ranking of the biggest lottery jackpots of all times, US Powerball and MegaMillions feature simply in ALL positions. And that’s why these two interstates American lotteries are becoming more and more popular also outside of the US. Good thing we Australians can now also join the run for these record-breaking jackpots! That said, it’s time to keep up with the Americans and understand everything there is to know about these lotteries and the main differences between them. What Are the Official Rules of US Powerball and MegaMillions? Both lotteries have a very similar format: pick 5 plus 1 extra number. Both lotteries offer nine prize divisions, which differ according to how many numbers you match with those drawn. The more you match, of course, the highest the prize. But it’s America, after all: so why win less if you can win more? US Powerball: PowerPlay can multiply your prize from the 3rd to the 9th division by up to 10 times! The PowerPlay can also double a second-division prize, but it is not applicable for the jackpot. MegaMillions: MegaPlier can multiply any winnings - except the jackpot - by up to 5 times. So, for example, if you won $1 million USD (approx. $1.3 million) in the second prize division in MegaMillions and you had chosen the number 3 in the MegaPlier, you will cash in $3 million USD (approx. $3.9 million) instead! Welcome to the "Land of Opportunities"! US Powerball vs. MegaMillions - Which of Them Offers the Biggest Jackpots? The thing with US Powerball, MegaMillions and huge jackpots is actually funny: both lotteries seem to be in a constant race to break each other’s records and the result? The 16 biggest jackpots in history were either US Powerball’s or MegaMillions’. Currently, US Powerball's $1.6 billion USD (approx. $2.2 billion) jackpot from January 2016 is the big champion. It broke the previous record – MegaMillions’ $656 million USD (approx. $870 million) jackpot – which was, for three years, the largest lottery jackpot the world had ever seen. In fact, from the 10 biggest jackpots of all times, 6 of them are US Powerball’s, and only 4 are MegaMillions’. Both lotteries have a starting jackpot of $40 million USD (approx. $54 million) since the rules for MegaMillions were changed in October 2017. Which Lottery Gives Me Better Chances of Winning - US Powerball or MegaMillions? If you are talking about hitting the jackpot, both lotteries don’t differ that much in their probabilities, with US Powerball offering slightly better chances of winning: US Powerball gives you 1 in 292,201,338 of hitting the jackpot, while MegaMillions’ odds of winning are 1 in 302,575,350. If you are talking about winning any prize, MegaMillions again wins: you have 1 in 15 chances of scoring one of the nine prize divisions. Now, if what you are looking for is a return of your investment, MegaMillions is the one, again. Considering that both lotteries cost from $5 per game, any prize bigger than $5 would give you at least a bit of profit. MegaMillions’ 5th prize division (2 main numbers plus the Megaball) pays out a fixed amount of $10 for its winners. US Powerball, on the other hand, offers lower chances of having a return of investment, when compared to its arch rival MegaMillions. The 7th prize division (2 main numbers plus the Powerball) pays a fixed amount of $9. A great way to increase your chances of winning are Lottoland's Betting Syndicates. Have a go at a US Power Syndicate or a MegaMillions Syndicate or just bet on both with our American Dreaming Syndicate! Both cost exactly the same at Lottoland: from $5 for a standard game, and $1.50 extra for the optional multiplier (PowerPlay and Megaplay). US Powerball and MegaMillions also have the same options of payouts for the jackpot: you can choose to receive it in a lump sum, or in 30 years of cash instalment payments. The Verdict: Which Is the Best American Lottery - US Powerball or Megamillions? As you can see, both lotteries are very similar, but each of them has its advantages and disadvantages when compared to the other. US Powerball paid out bigger jackpots than MegaMillions so far But when it comes to actually making money when betting on the lottery, MegaMillions offers better chances. Difficult decision? Actually, it is easier than you think: when it comes to American lotteries, there is no better or worse. After all, there are no other two lotteries in the world that pay out such gigantic jackpots like MegaMillions and US Powerball do. Good thing in Lottoland® there’s no need to choose! Just go ahead and try your luck on BOTH lotteries! 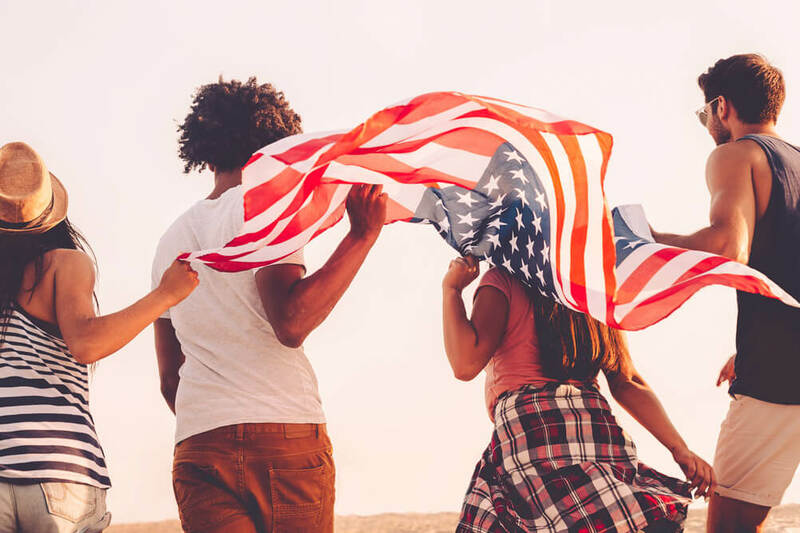 Make the American Dream come true with MegaMillions (draws Wednesdays and Saturdays 1pm AEST/3pm AEDT) and US Power (draws Thursdays and Sundays 1pm AEST/3pm AEDT)!